Nestled in the heart of the world’s only private ski and golf community, the 160-acre Family Compound is without question the most unique offering ever presented in the history of the Yellowstone Club. The story of the property dates to the founding of the club itself when Tim and Edra Blixseth retained ownership of a 160-acre site inside its boundaries. The couple built two 2,240-square-foot, 3-bedroom residences that were to serve as guest homes for a main residence that was never constructed. 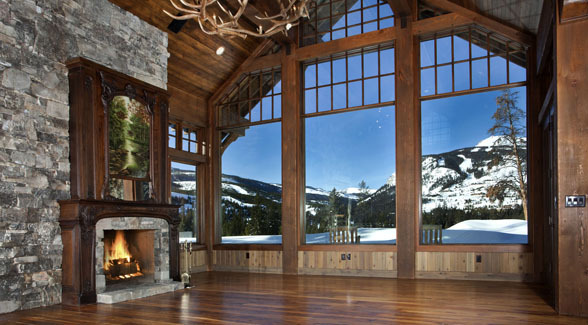 Situated at the end of a long, secluded driveway, each of the cabins features an open floor plan, vaulted ceilings, massive wood-burning fireplaces, and large floor-to-ceiling windows. Beautifully appointed bathrooms and well-designed kitchens round out the interiors, while an expansive outdoor living area creates an ideal setting for nights out beneath the Montana sky. Yellow Mule Creek runs year round through the property’s western boundary. It is this acreage and improvements that are to be auctioned by Edra Blixseth’s bankruptcy estate pursuant to a court-approved bidding and auction process. CrossHarbor Capital Partners has tendered a stalking horse bid of $10,850,000, consisting of $850,000 in cash and $10 million in a credit bid against CrossHarbor’s lien on the Family Compound. Per the court’s order, the minimum required for qualified competing bids by third parties is $11.1 million. Deadline for submission of the $11.1 million is 4:30 p.m. Mountain Time on May 16. The receipt of qualified competing bid(s) will result in an open outcry auction to be held at 9:00 a.m. Mountain Time on May 20, 2011 at the offices of Datsopolous, MacDonald and Lind in Missoula, Montana. Membership to The Yellowstone Club is not included as part of this offering. The buyer may apply to The Yellowstone Club for membership, however, membership is not guaranteed. Independent investigation is advised. Additional information about the auction and the rules governing competing bids will be made available upon request.